Internationally recognised Department of Agriculture and Fisheries pasture agronomist Dr Richard Silcock has spent half a century using his considerable skills to help build Queensland’s beef and sheep industries. Dr Silcock retired in September this year and was honoured for his many contributions by DAF deputy director-general Dr Beth Woods. “Richard’s distinguished career in pasture science started at the Charleville Pastoral Laboratory in 1969. He’s witnessed many changes to the organisation but has managed to stay focussed on conducting relevant, high quality science that has delivered improved management of Queensland’s extensive grazing land,” Dr Woods said. One of his legacies and greatest contributions is the QPastures database, information on the many pasture and forage plants collected and evaluated in Queensland over the past 117 years. Dr Woods said Dr Silcock will continue to be acknowledged as a pioneer in developing an understanding of the ecological principles underpinning pasture establishment, growth and management in both native and improved pastures. Dr Woods also paid tribute to his commitment to mentoring young researchers and extension officers, and working with industry and his scientific peers to advance both on-ground outcomes and policies. 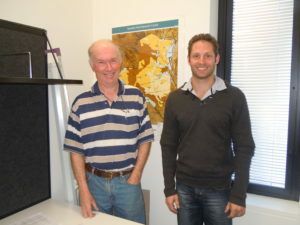 “Richard’s long and fruitful career has advanced Queensland’s agriculture, and his influence will still be felt, not only through QPastures and his other research initiatives, but in the many officers and scientists he has worked with who will continue the work that he has pioneered,” Dr Woods said. 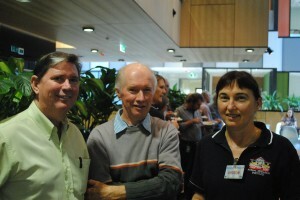 Richard was farewelled with lunch at the Red Brick Hotel on 30 September where colleagues from the Charleville Pastoral Laboratory, Toowoomba and the Ecosciences Precinct, Dutton Park celebrated highlights of his career and provided insights for his retirement. Richard has accepted a Research Fellow voluntary appointment with the Department to finish off a few papers while transitioning to his new lifestyle with wife Jan. So if you are lucky, you might run into him at Ecosciences Precinct for a catch-up on pasture agronomy. Stephen Nottingham, DAF (l), Richard Silcock and Alison Spencer (r).